In my efforts to read more fiction, one of the tiles that inevitably came up on my list was Will Grayson,Will Grayson, a novel written by two giants in the young adult fiction mark - John Green and David Levithan. I had at last read Levithan's Boy Meets Boy along with Every Day, but I can't say that I'm all that impressed. His often idealistic representations of LGBT-friendly utopias are a bit of a stretch and while seemingly give hope for the future can also set some troublesome expectations. He hasn't been significantly harmful but it doesn't quite set realistic expectations either. I ended up with the Audible version of this book because yet another of the many, many sales that the site runs for its members. It was, at least, an interesting "reading" experience. 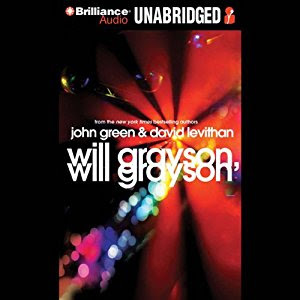 Synopsis: Will Grayson, Will Grayson is a book by John Green and David Levithan. The Brilliance Audio versio has narration by Nick Podehl and MacLeod Andrews. The book starts as two parallel stories focused on two different teens named Will Grayson. The first Will Grayson is one who tries not to get involved in things and to generally stay away from others in order to avoid complications or personal pain. The second Will Grayson is a closeted gay man who is severely anti-social save for his online conversations with an online figure he knows as Isaac. But you know how it is with the internet - you can't tell if you're actually talking to a dog or something. Each have their personal story arcs and unusual collections of friends around them. And in time the story works its way to a point of overlap where the two Wills meet, as was inevitable given the structure of this story. But no, this is not about Will Grayson 1 becoming to something more intimate with Will Grayson 2. But there is still something significant that gets shared between them. What I Liked: The voice talents for this book were pretty good and despite obviously not being in their teens, they did well in terms of conveying a lot of the complicated emotions of that point in the lives of these young characters. And they were also distinct enough in tone to make differentiating the two characters easy enough despite losing the vivsual cues of the original book that sort of defined the style of things. The story in itself wasn't too bad. It had a generally positive tone to things and it did try to tackle some of the more complex emotions of the teen years without diving deep enough to trigger more complicated and risky subjects. And it generally tries to provide a somewhat positive slant to things in the longer term in order for things to end well. What Could Have Been Better: That same sense of doing safer things also meant that didn't address things that it could have despite getting rather near to them. One such matter was Will Grayon 2's bouts of depression being a part of the story but not really addressed. As much as this is a teen novel, you'd think that it would still be something worth putting a face on instead of avoiding. And then the whole alternating chapters bit was a generally clever way of addressing things but it also wasn't all that new an idea nor did it make the book feel like more of an actual collaboration. The two characters had largely independent story across their rspective chapters apart from one character crossing over from one side to the other but not necessarily a better blending of the tones of the books. But hey it's not easy to write books with two authors actively involved. TL;DR: Will Grayson, Will Grayson was a pretty ambitious little book and for the most part the final result was pretty okay. It's nothing amazing and I won't quite get around to recommending the title to LGBT teens but I wouldn't disuade them from reading it entirely. Thus the book gets a good 3 strange things that Will Grayson (haha) sees while there out of a possible 5.